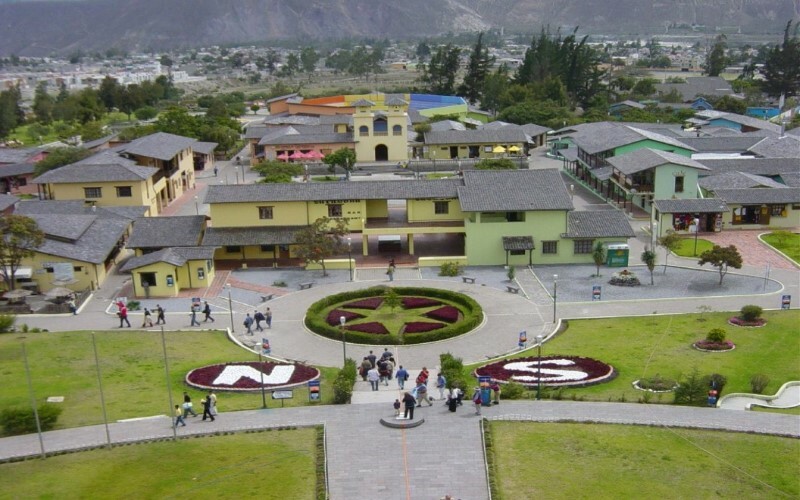 The Mitad del Mundo is a land owned by the prefecture of the province of Pichincha, Ecuador. It is located in the parish of San Antonio of the Metropolitan District of Quito, to the north of the center of the city of Quito. 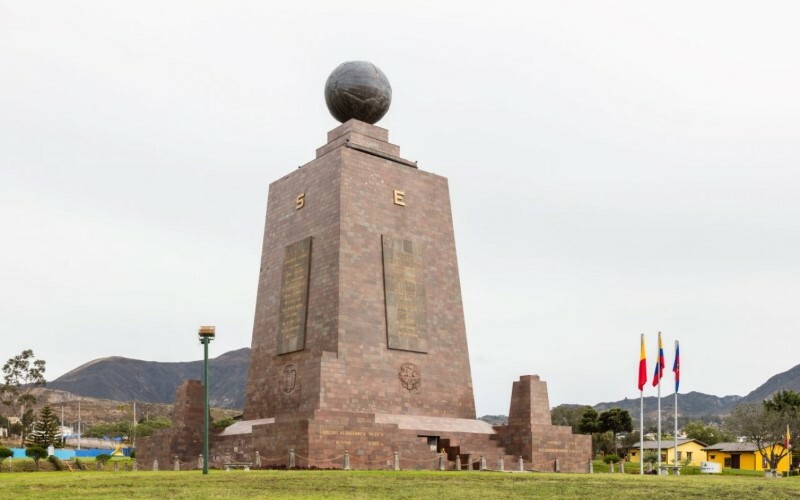 The main attraction of the place is the monument to the Middle of the World, whose purpose is to highlight the exact location of the equator or equator, from which the country takes its name, and also highlight the Franco-Spanish geodesic mission of the century XVIII that located the approximate site through which the equinoctial line passes. There is also the Museo Etnográfico Mitad del Mundo, a museum about the indigenous ethnography of Ecuador. A small city that surrounds the monument acts as a tourist center, offering a replica of a Spanish colonial city called "Ciudad Mitad del Mundo". Between 1736 and 1744, a French geodesic mission (led by Charles Marie de la Condamine) traveled to Ecuador (then part of the Spanish empire) to resolve a discussion that existed at the Paris Academy of Sciences, about whether the globe had Flattening at the poles or at the ends. This mission made astronomical measurements and calculations to determine what effectively the Earth was flattening. From there the Metric Decimal System is derived, because the Metro is the tenth-hundredth of a quadrant of the terrestrial meridian, which was measured by the mission of La Condamine and other experts who were in the expedition. Ecuador was chosen for the measurement because it offered more stable conditions for the accomplishment of the mission, since in Africa and Asia the conditions were not stable. Various instruments were used in the mission, but the main problem was the series of sensitivities that emerged in the communities, which saw foreigners doing strange things. An anecdote is known in the journal of La Condamine, according to which the scientists were able to install two references made of brick and mortar for their astronomical measurements. The third, they had to do it on a hill near Quito, which is called Cruz Loma (because there was a big cross there). There they were able to carry out the measurements of Caraburo, from Hoyambaro, and the third was that of Cruz Loma. This last measurement caused them enormous difficulties because they had to carry the bricks on a mule back, after the astronomical calculations, to install this reference with a small piece of metal (possibly bronze) that marked exactly the place of the measurement. The problem arose when the concern of certain indigenous communities gave way to investigate what these people were doing. This caused that the piece of metal was destroyed, and when the pyramid of Cruz Loma had already been constructed, the other two pieces of metal were destroyed. Then, when they installed to make the measurements and wanted the referents, they could not use them anymore. The concern arose for a mission that for the common mortal was strange. When the mission was installed, Spain was suspicious of the mission and sent two high-quality Spanish scientists, who were Jorge Juan and Santacilia and Antonio de Ulloa, who presented themselves as mission assistants, but in reality it was to spy on what They were doing. The Ecuadorian scientist, Pedro Vicente Maldonado, who collaborated closely to ensure the success of the Mission in Ecuador, was joined by his knowledge of geography and geodesy.1 At the end of the 18th century, General Charles Perrier of the French Academy of Sciences , Was sent on a scientific mission to verify the outcome of his predecessor. It is worth mentioning that the only monuments found in the equinoctial line to date are the monument of La Catequilla, an ancient archaeological site and the Quitsato Solar Clock. The old monument of the equator in Calacalí (2008). In 1936, with the support of the Franco-American Committee, the Ecuadorian geographer Luis Tufiño, located the signals left by the geodesic mission of the eighteenth century. Based on this finding, a monument 10 meters high was built in San Antonio de Pichincha. In 1979 the monument was transferred 7 km to the west, to the city of Calacalí. 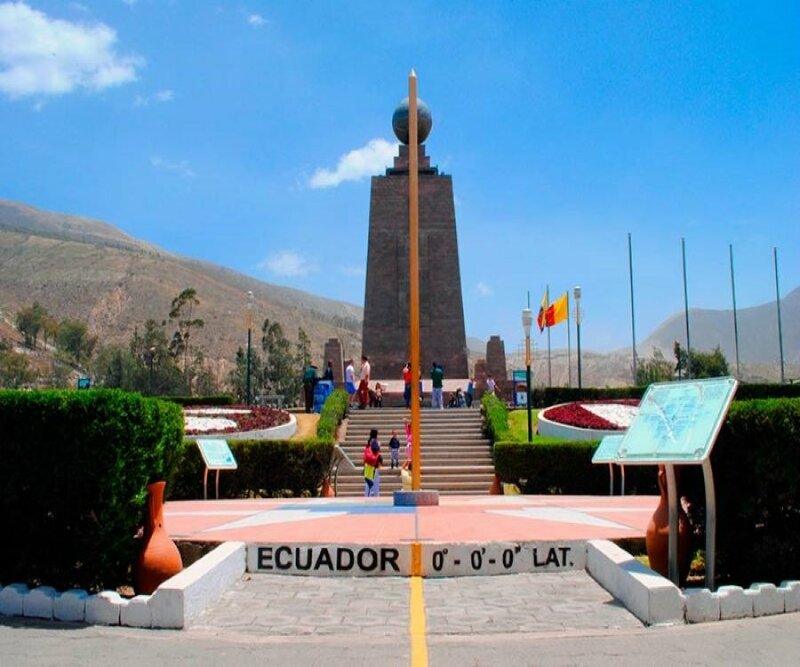 Between 1979 and 1982 a monument of 30 meters of height was constructed (replica of the monument that was transferred to Calacalí) to mark the point where it was believed that the Ecuador crossed the country at that moment. In fact, a line was drawn from the center of the staircase facing east, crossing the square to mark the Ecuador, and over the years countless tourists have photographed crossing the line. However, the whole structure is actually about 240 m south of the true equator (on the parallel 0 ° 0 '7.83 "South latitude) thanks to the appearance of GPS technology, at the end of the 20th century. The pyramidal monument, with each side pointing to a cardinal direction, is made of iron and cement and covered with carved and polished stone of andesite and topped by a globe of 4.5 m in diameter and 5 tons. Inside the monument there is a small museum that shows elements of the indigenous culture of Ecuador, such as clothing, descriptions of the various ethnic groups, and samples of their activities. It has four monoliths in the angles and its sides have the geographical direction of the four cardinal points. On each side of the monument are commemorative inscriptions of the Franco-Spanish geodesic mission. Thus we have to the North a commemorative legend, dedicated to Pedro Vicente Maldonado, who collaborated closely with the Geodesic Mission in the year 1736. An engraving that appears below the inscription represents the fourth of the circle used by the Geodesic Mission of the XVIII century. On the Western side is an inscription dedicated to Jorge Juan and Santacilia and Antonio de Ulloa, two illustrious Spaniards who collaborated with the scientific work of France. Under the inscription is engraved the shield of Spain (as it appeared in years 30). In the South face is an inscription of recognition to the Government of Ecuador for the scientific work of the Geodesic Mission of France. Under the inscription is engraved the shield of Ecuador.1 Finally, on the east side, is an inscription dedicated to La Condamine and his French colleagues of the mission. Under the inscription is engraved the coat of arms of France. The globe of the upper part (made of metal) has the continents in relief. This globe is wrapped from East to West by a metallic tape, indicating the Equator, dividing the sphere exactly into two halves. The orientation of the metal balloon corresponds to the actual position of the Earth, that is, the minor axis of the poles is parallel to the real axis of rotation of the Earth.